I have very, very fond memories of playing Mario Party on Nintendo 64. It combined three of my favorite things: board games, video games and the Mario franchise! I don’t think I’ve owned any since Mario Party 3, but I’ve always tried playing them when I could, even the more recent Wii versions. 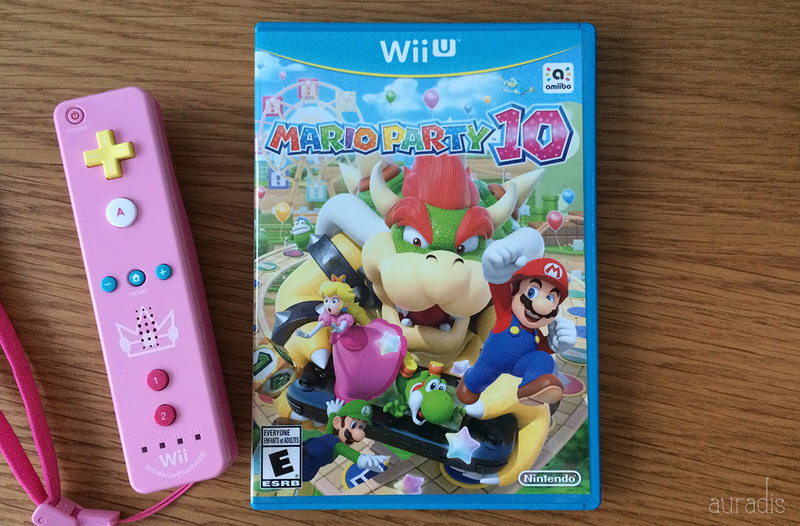 Needless to say, I was psyched about the the newest version, Mario Party 10; J preordered it so I could play it on release day. I hadn’t read any reviews, partly because all game-related websites are blocked at work (boohoo) and because I wanted to go into it with an open, unspoiled mind since I was planning to buy it regardless. Well…I didn’t fall in love with the game. But let’s put good news first. My unexpected favorite thing about MP10 is its badminton game (found under Bonus Games). Why is it there? I don’t know. It doesn’t seem to be a minigame that you could play under normal party mode circumstances…it’s like they just happened to make it and stick it in randomly. And it’s strangely good! I’ve never had the honor of playing a badminton video game (it’s a fringe sport in this industry I suppose), and I couldn’t get the controls quite right (Peach kept lunging and falling down), but it was fun and evocative of the actual sport. Well done. I HATE THIS SO MUCH. Nintendo introduced this concept with MP9, and I was praying that they would do away with it, but alas. Back in the day, I got pretty good at devising winning strategies, which necessitates both knowledge of the board as well as the independence to control my own movements. 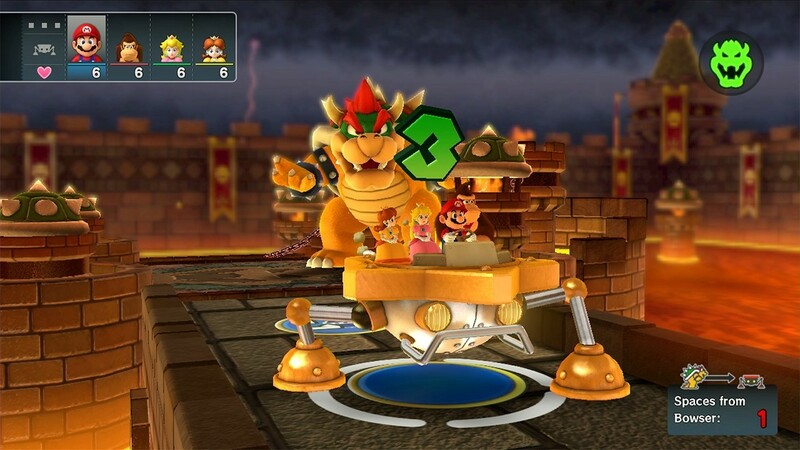 Now, though, all four characters are riding in the same vehicle, so where you go depends on what the other three people do. As with MP9, the objective of normal play is to collect the most “mini stars,” and one way to get them is to cross one of the occasional mini-checkpoints that award the active player 5-10 mini stars. Whether you’re within reach of one of these mini-checkpoints during your turn is completely up to the other players. I find it very frustrating to lose that kind of autonomy, which I couldn’t really describe a good reason for until I played a very frustrating game in which I was stuck in dead last the entire time. 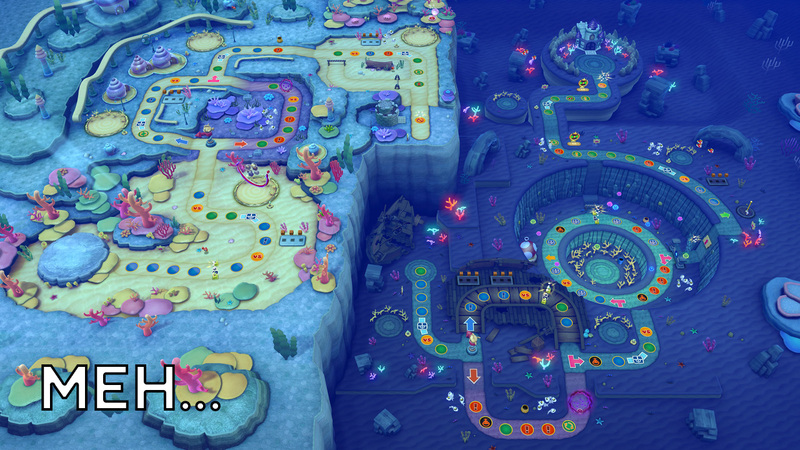 Previous Mario Parties, with the walking system and coins, were more egalitarian. Everybody had more or less the same chances to land on the same spaces. But now, if you happen to miss those mini-checkpoints, then your main opportunity to gather mini stars vanishes. Another necessary aspect of strategizing is familiarity with the board. In versions 1-8, you would go around and around the board like a game of Monopoly, eventually learning where to step and where not to. (I still remember that crazy Spiny Desert one from MP3 with the cactus shortcut!) Since MP9, the board takes a linear path, like Candyland. Missed something good? Well, you’re never going back, so forget about it. This isn’t inherently bad, but it does encourage less engagement. There’s less need to pay attention to what I’m passing (especially during other players’ turns). It doesn’t help that the boards themselves are less interesting. In older versions, you would collect coins to buy stars. Now, the only interesting thing you can land on is a space that will give you a special die. (Yawn.) It’s just so much less…inspiring. Also you can’t customize game length. Ugh. From what I remember, old MP games could be as epic as a game of Settlers. (I especially liked the versions that let you choose the number of turns in the game.) But in MP10, I feel like the games just whiz by. I reach the mid-game checkpoint without feeling like I’ve really done much at all. Now minigames only happen if you land on certain spaces. Sometimes there are ~hidden minigame blocks~. And also boss minigames that happen twice a game. Point is, they’re not routine, which means more time just moving on the board — I could just go play a game of Sorry — and less chances to win mini stars!!! -Why are there SO many chances to lose half your mini stars at any given time?! It’s like getting pelted with a blue shell once per lap per track. -Bowser Jr. spaces are insultingly predictable. You in first place? Lose half your mini stars! Computer in last place? Give five mini stars away — just kidding! Gain five mini stars out of sympathy! -What’s up with boss minigames pausing midway just to show everyone’s scores? How does that add to the game in any way? Only idiots (and children) need to be reminded to keep track of the score! -The minigame instructions are way too sparse. Yeah, so in older versions it took a while to read the directions, but at least you knew how the game was going to be played! What’s up with the one measly scrolling line of info?? Bowser Party mode is aite. Overall, I just feel like they dumbed down the game and added a bunch of glitz with not as much substance. The graphics are great and some of the boards are simply beautiful (the Air Ships one especially), but during actual gameplay, I feel like I’d use more brainpower in a game of Connect Four. A great game should have a proper balance of luck and skill, and I feel like this time around, they just screwed up the balance and put too much emphasis on luck. I know it’s dumb and whiny to expect a company to put out new versions of the exact same game year after year without changing anything. But I’m sad that they seem to have taken what I loved about Mario Party out of the game, and I don’t think I’m saying that merely out of a subjectively rosy view of my childhood games. I applaud Nintendo for trying to mix things up, but I hope they come up with a more winning formula next time (because I’ll probably keep buying them…). You are currently reading Not The Mario Party I Remember at auradis.